I have to confess that I don’t actually own a slow cooker, but I do have a new large rice cooker that does the trick! It was a gift from my dad so we can cook rice at our DIY wedding reception (hey, he is Cuban! ), but I figured I needed to make sure it worked ahead of time. 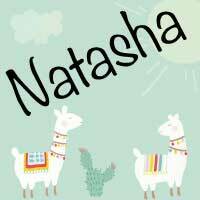 I’ve actually used it twice in the last week or so as a slow cooker, and it does the job admirably. 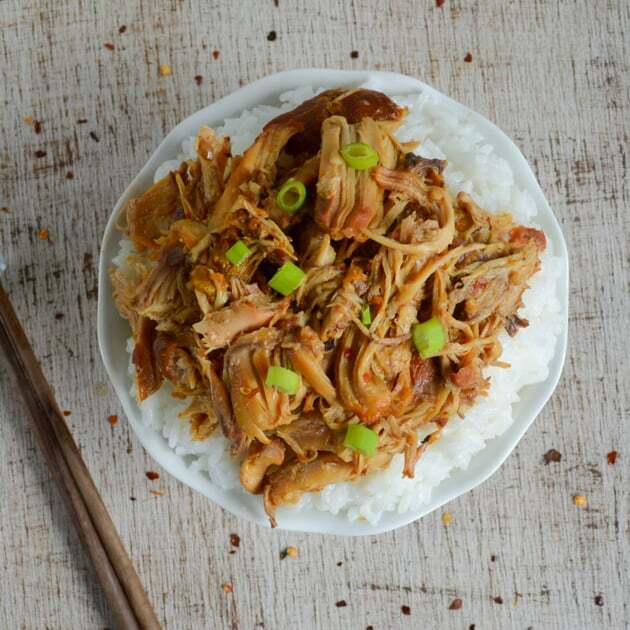 This slow cooker orange ginger chicken was the first thing I made in my new rice cooker, and I was very pleased with the results. This dish is somewhat sweet, but has an undeniable bite. Of course, you can always leave the pepper out or add even more to suit your tastes! Either way, if you follow the recipe it is Paleo-friendly and low sodium because it uses coconut aminos instead of soy sauce. 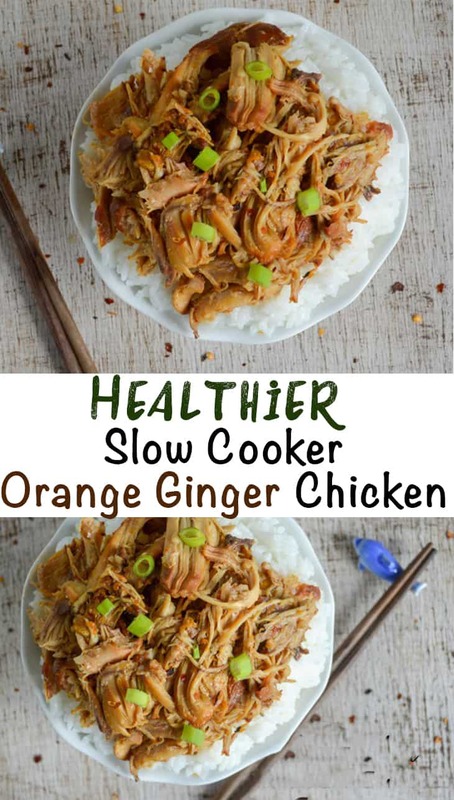 I hope you enjoy this slow cooker orange ginger chicken recipe as much as we do! Of course, if you’re looking for a Paleo meal, you’ll want to serve the chicken without the pictured rice! Riced cauliflower works well, or you can always just eat the chicken by itself. I know some people are turned off by chicken thighs, but using bone-in thighs is key to creating succulent, flavorful shredded chicken for this dish. If you really can’t stand the dark meat, you can use breasts, instead, but it won’t be quite the same. I chose to thicken the sauce slightly by simmering it in a skillet after the chicken was cooked. If you’d like a thicker sauce, you still need to transfer the sauce to a skillet. Then, whisk a tablespoon of corn starch together with three tablespoons of water. Whisk this slurry into the sauce and simmer it until it has thickened slightly, which should take about three minutes. I like the sauce without cornstarch, but the choice is yours! Heat the coconut oil in a non-stick skillet over medium high heat. When the oil is hot and shimmery, add the chicken thighs and cook until the under side is browned, about 5 minutes minutes. Flip the thighs and brown the other side for an additional 2-3 minutes. Once the thighs are fully browned, remove them to a plate and allow them to rest until they're sufficiently cool to remove the skin (if present) without burning yourself. While the thighs are cooling, combine the chicken broth, honey, coconut aminos, garlic, onion, ginger, orange juice/zest, and red pepper in a medium bowl and whisk throughly to combined. Once the thighs are skinned, transfer them to the slow cooker. Make sure they are all laying flat and not overlapping. Pour the prepared sauce over the chicken. Add water or chicken broth until the thighs are almost submerged, but not quite. Cook until the chicken is tender, about 4-5 hours on low. Once the chicken is tender and nearly falling apart, remove the chicken with tongs and shred it using forks. If you'd like, transfer the sauce to a skillet and simmer to reduce it. 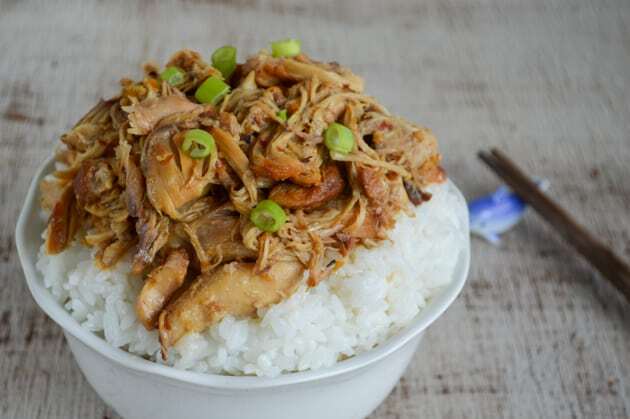 Return the shredded chicken to the sauce and serve with green onions over rice or riced cauliflower. If you’re feeling particularly bold, adding about a teaspoon of Sriracha sauce to the dish spices things up a bit! I’m a little bit of a wimp when it comes to spicy food, but Papi Chulo enjoys spice so I try to create things that are a slightly hot every once in a while. Whether you make it spicy or not, this dish is a good way to beat takeout cravings by creating something far healthier, and far less expensive, than ordering Chinese food. I’m tempted to make it again soon, but my dad’s been teasing me that I’ll wear the rice cooker out before the reception. That and I need to actually try it out with rice eventually! 2018 update: Our Aroma rice cooker is still going strong! I wish my dad were still alive to see how much we use his gift. We’re also using an Aroma electric pressure cooker now. Are there any takeout-style meals you enjoy making at home? I was wondering where the orange juice and zest take place in the recipe?